Location: West side of Station Road. Present state: The station buildings have been demolished and the entire station site was buried as part of a land fill scheme. An industrail estate now stands on the station site. 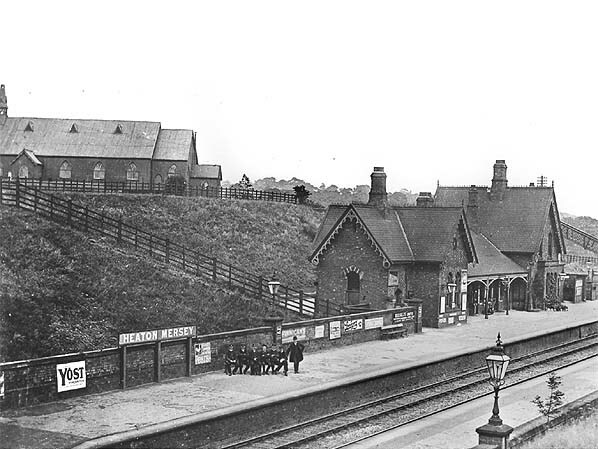 Notes: Heaton Mersey station opened on 1st January 1880 as part of the Manchester South District Railway that connected Manchester Central to Stockport Tiviot Dale. the line would make a connection with the Cheshire Lines Railway’s (CLC) route between Woodley and Skelton Junction at Heaton Mersey. However, despite obtaining the Act, the MDSR was unable to start work on the construction of the line due to financial difficulties. At this point the CLC became interested in purchasing the MDSR as they saw value in the projected route to Manchester. Unfortunately one of the CLC partners, the Great Northern Railway (GNR), did not see any value in the route so the CLC was not able to proceed with its idea. London Road Station which was a joint London and North Western Railway (LNWR) and MSLR station. A bill was granted by Parliament on 11th August 1876 which authorised the MR and MSLR to take over the MSDR and build the line from Heaton Mersey to Manchester. Within a month of the Act being signed the MSLR got cold feet and decided that they did not want to proceed. The MR was desperate to create a route of its own to Manchester. To make matters worse it had been given notice to quit operating to London Road Station. The MR went back to Parliament, and on 12th July 1877 they were given authority to take over the MSDR and build the line. building was mostly single storey but included a two storey station master’s house at its southern end. An awning provided protection from the elements. Booking facilities, a parcels office, ladies’ and gentlemen’s waiting rooms and toilets were all accommodated in the building. 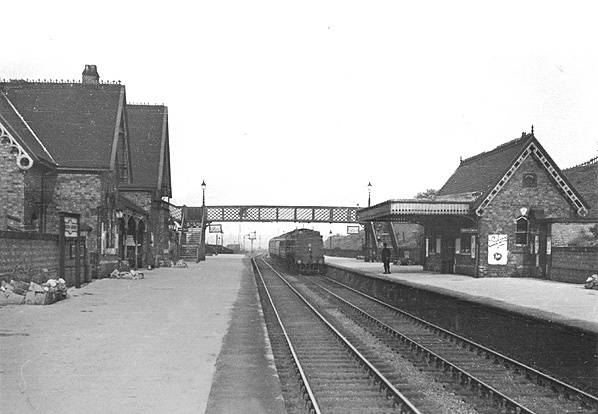 An iron footbridge gave access to the northbound platform on which stood a brick-built single storey waiting room which also had an awning. Goods facilities were located to the south of the station. When the station opened on 1st January 1880 it was served by trains that called at all stations between Manchester Central and Manchester London Road via Stockport Tiviot Dale. Fourteen trains ran in each direction and, although Heaton Mersey was one of the quieter stations on the line, it was still very busy. The local service was known as the South District service. The main reason why the MR had wanted to build the South District line was to give it access to Manchester without the need to use lines not in its control. From August 1880 the MR started to run express trains between Manchester Central and London St Pancras via the South District line. These trains passed through Heaton Mersey, but they did not stop as the station was regarded as very much a local facility. an interchange station where passengers could transfer between long distance and local trains. Express services were using the new route by July 1902. Heaton Mersey continued to be served by a steady stream of South District passenger trains throughout the first years of the twentieth century. The service settled into a regular pattern with most services running between Manchester Central and Stockport Tiviot Dale, and Manchester Central and Cheadle Heath. The Great War led to a reduction in services, but by 1922 things had started to return to normal. In 1923 Heaton Mersey station became part of the London Midland and Scottish Railway. The South District services continued to serve the station, and a steady stream of express passenger and goods trains passed through. During the 1930s Heaton Mersey station started to see a decline in passenger numbers as competition from buses had an impact. opening in 1880. There was no reduction in express services though. From 1958 work began on the electrification of the former LNWR route from Manchester to London, and as a result even more traffic was routed along the former MR line. 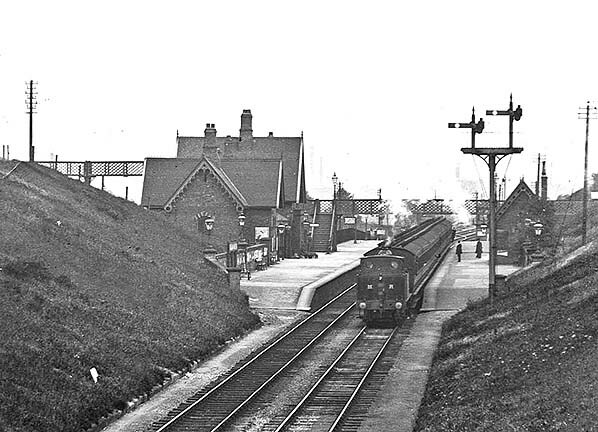 Early in 1961 Diesel Multiple Units (DMUs) were introduced onto the South District locals, however they were unable to save Heaton Mersey station. It was used by only a handful of passengers each day, so British Railways decided to close it to passenger services on 3rd July 1961. Mersey, and they finished on Sunday 4th May 1969 when the very last train services operated out of Manchester Central. 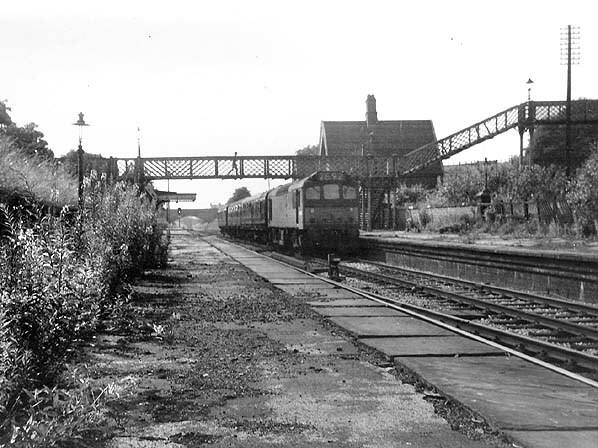 The odd freight train continued to pass through the station site during the summer of 1969, but on 17th August the line was disconnected at Chorlton Junction. It was lifted in 1970. After closure Heaton Mersey station was demolished, and the cutting in which it stood was used as a landfill. Heath. Upon leaving Heaton Mersey it would call at all stations to Manchester Central. A local South District Service bound for Manchester Central pulls into the northbound platform at Heaton Mersey in 1939. At this time the South District Services ran to a high frequency calling at all stations between Manchester Central and Stockport Tiviot Dale or Cheadle Heath. 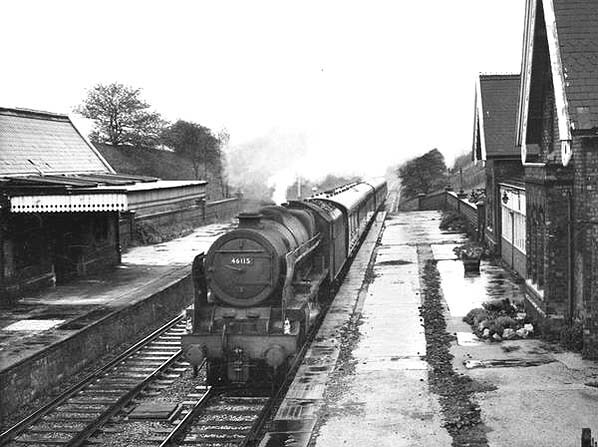 A southbound passenger train speeds through the closed Heaton Mersey Station in 1964. In July 1965 a local service hauled by a Sulzer type 2 diesel locomotive heads south through the closed Heaton Mersey Station. Looking northwest towards the station site in February 2009, from a location adjacent to the remains of Vale Road bridge. 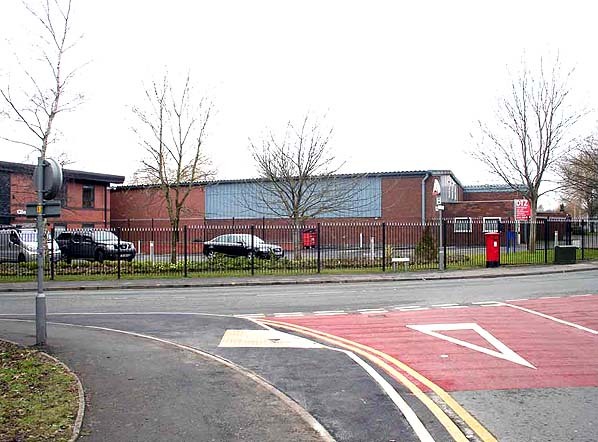 The trackbed and embankment have been cleared and the site is now occupied by an industrial estate. 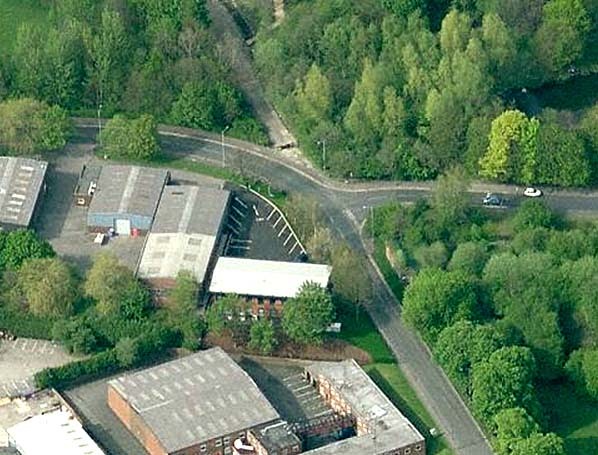 Aerial view showing the site of Heaton Mersey station . The bridge aburment can just be made out to the right of the street lamp below the road junction. The industrial estate on the opposite side of the road is on the station site.